We are now bringing you personalized beads with the name of your choice. The options are limitless from the love of your life, to the name of a child, to your own name, the decision is yours. For names up to eight letter the name will appear on the bead twice. Flowers are used to fill in the space to complete the overall look. For names with nine to sixteen letter, the name will only appear once. The length of the name is limited to sixteen letters and there can only be one name per bead. Bead measures approximately mm wide and 10mm in diameter. 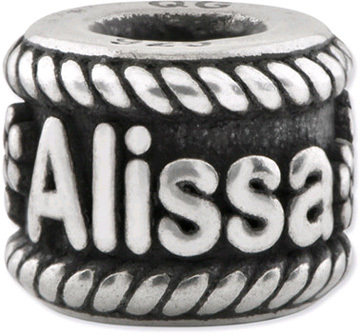 We guarantee our Personalized Sterling Silver Bead to be high quality, authentic bead jewelry, as described above.